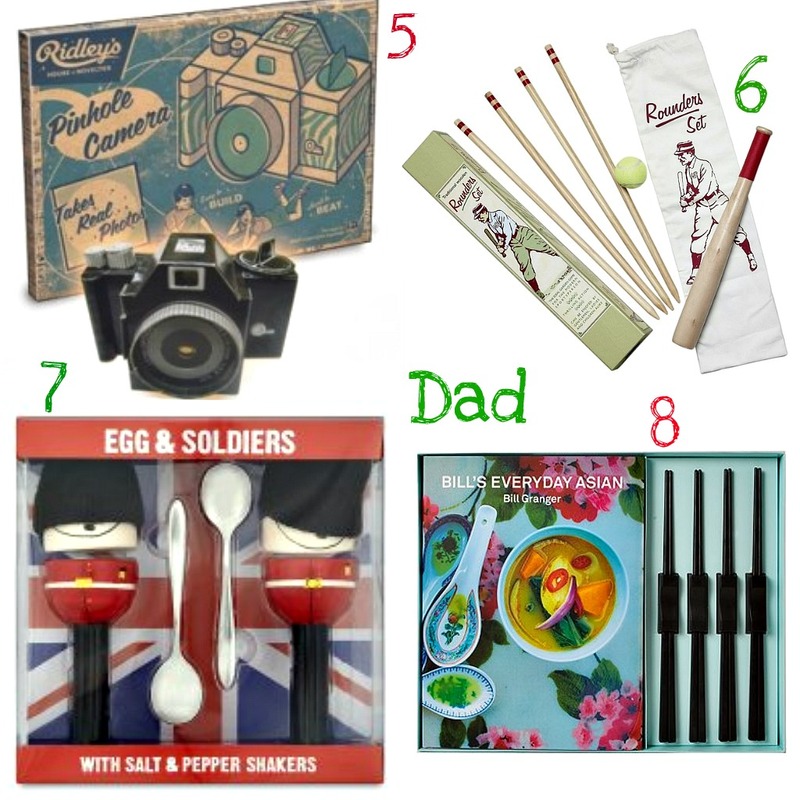 Here is part 2 of my gift guides and this time it features ideas for parents. I think people get stuck buying parents the same gifts every year, I always get my dad cigars and sock YAWN! My mam always gets a new CD, slippers and jewellery. These guides have given my lots of good ideas and a reason not to be so boring with my gift giving. I love the bread bin with the Welsh for bread on and the site also has a tea towel with the Welsh cake recipe on, well worth checking out. 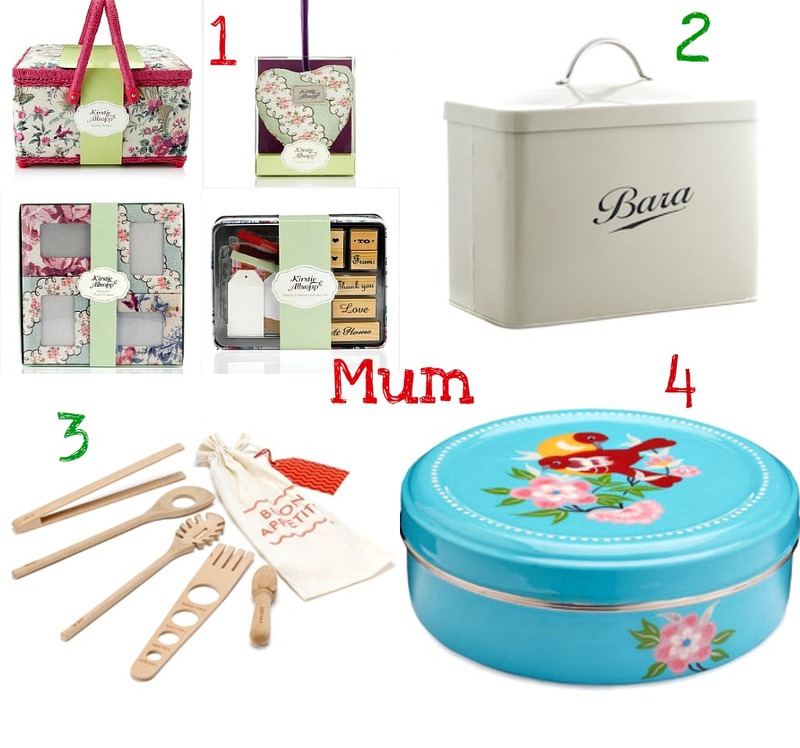 I couldn't pick my favourite piece from the Kirstie Allsopp range, they are all so nice. The green glass cake stand and stamp kits are very pretty and affordable so they are going on my shopping list. I think the camera kit and rounders presents are great fun and something that you can use together. I usually take the dog for a walk on Christmas day and try and walk off some of my dinner but a game of rounders would be just as good! Have you got your parents gifts sorted yet? I've been thinking about what to get my mam for ages and still don't have a clue. She doesn't really like to cook or use expensive beauty products so I may take her out for dinner and to see a show. I've got 34 days to make up my mind! P.S. I did some gift guides last year which you can see here and here which might give you a few extra ideas. i never know what to get my parents ! im slightly disturbed that my dad wants lady gaga and rhiannas album!! Nice ideas gem :] I've got mama smith a brita filter - boring, a pink brita filter - exciting yes? Aww such cute ideas, buying presents for your parents always seemed challenging to me. Usually my fall back is jewelry with my mom and when it comes to my Dad/Step-dad, I never quite know. A piece of 2x4? A random saw blade? Something else random from Home Depot? Anyway lovely finds and I'm sure your parents will love the presents you pick out for them. The cake tin is amazing, I really want one! Number five is so cute! My parents are divorced so I now have to find two different equally lovely things. x hivenn p.s enter my $200 shopbop giveaway? All these are great gift ideas. I love the cute cake tin, I didn't even know Monsoon did homewares! I always get stuck with what to buy my mum as she hates makeup/bath stuff etc. which is what I usually get for everyone else! Love these kind of posts with gift ideas :) And your ideas are great! Thanks Gem, keep me posted on the blog meet up. Im a newbie at all this but find myself very addicted.